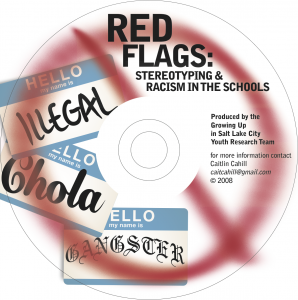 Red Flags : Stereotypes & Racism in the Schools (Salt Lake City, Utah 2007-2009) is a participatory action research & documentary project focused on students experiences of racism in schools. The youth research team conducted over 20 interviews/focus groups with students in the Salt Lake Valley, in addition to re-enacting their own experiences of institutional racism, and composing the score for the video. The Red Flags : Stereotypes & Racism in the Schools research team was a community-university partnership including Salt Lake City westside high school students/youth researchers, University of Utah faculty members and students, the Salt Lake City Mayor’s YouthCity program, and University Neighborhood Partners, University of Utah. 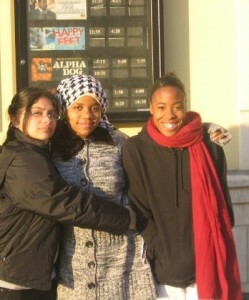 Cahill, C & Bradley, M (2011) Documenting (In) Justice: Community-based participatory research and video. In Sutton & Kemp (eds) The Paradox of Urban Space: Inequity and Transformation in Marginalized Communities. Palgrave. Cahill, C. (2009) Beyond “us” and “them”: Community-based participatory action research as a politics of engagement Finding Meaning in Civically Engaged Scholarship. Information Age Publishing: Charlotte, NC. Cahill, C.; Bradley, M.; Castañeda, D.; Esquivel, L.; Mohamed, N.; Organista; J.; Sandberg, J.; Valerio, M.; and Winston, K. (2008) “Represent”: Reframing risk through participatory video research. In Downing, M. & Tenney, L (Eds.). Video Vision: Changing the Culture of Social Science Research. Cambridge Scholars Publishing, pp. 207-228.